'Know your Kolkata Food Bloggers' event has literally made us search each others blog in depth and check exciting recipes and lovely reads. This week, it is my pleasure to introduce a lovely and passionate person, Antara Ray. I met her very recently when we got together with other members for a restaurant review. She works for a consultancy firm and finds cooking and experimenting very interesting and joyous. Her blog Antypasti has some amazing recipes that are quick, simple and delicious. Frankly speaking, the first list I checked was her bakes and then the desserts. But I was determined to steer away from usual stuff I keep doing and find something that is simple and quick, though her Lazy tart kept calling me back. I decided on this very healthy soup called Creamy Pumpkin carrot soup. I loved the idea of using these two vegetables and turning them into a soup and made some basic changes. Vaanya, my daughter is a big fan of soups and this was definitely meant for her. The soup was made in a jiffy and plated for the picture taking ritual. Vaanya eyed the soup and I had the most difficult time trying to keep her away from dunking the carrot flowers in the soup and wanting to have it. The pictures were hurriedly taken as I could no longer bear my 2 year old wanting her bowl of soup so badly. It brought me so much satisfaction to see her love the soup and have her fill. 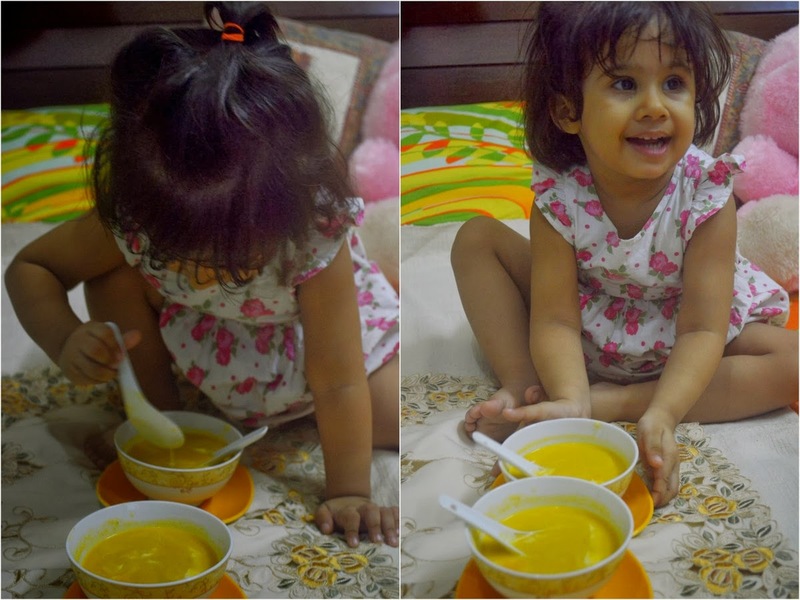 Thank you Antara for introducing such an easy and healthy soup to us. This will definitely become our family favourite. Take olive oil in a deep pan/kadai and add garlic and onions. Let them cook till onions turn pink in colour. Add the diced carrots and pumpkin and season with salt and black pepper. Cook them for 4-5 mins on low heat. Turn off the heat and allow to cool. Transfer to a blender and blend to a smooth paste. Heat the pan again and pour the paste in it through a sieve. Add some water to make the soup reach a consistency to your liking. Serve warm with some cream and carrot flowers. Delicious and very easy to make soup. Loved the pics of Vaanya...so cute. Thank you Kamalika for helping me making my blog look better. Soup looks prefect for a dull evening dinner..Wonderful,creamy soup..Wonderful to know about Antara's space..
healthy soup really n nice colour.. Delicious yummy soup , lovely color, Vanya is enjoying it. Very easy and healthy soup. I like your presentation. Your daughter looks cute. "My Monthly Event - Spotlight: Festive Treats "